Well before Spotlight won for Best Picture and Leonardo DiCaprio scooped up his first-ever Best Actor award for The Revenant, a bevy of Hollywood beauties — all donning stunning platinum baubles — illuminated the Red Carpet at the 88th Academy Awards. The jewelry mirrored the star-studded festivities — exciting, dramatic and frequently over-the-top. 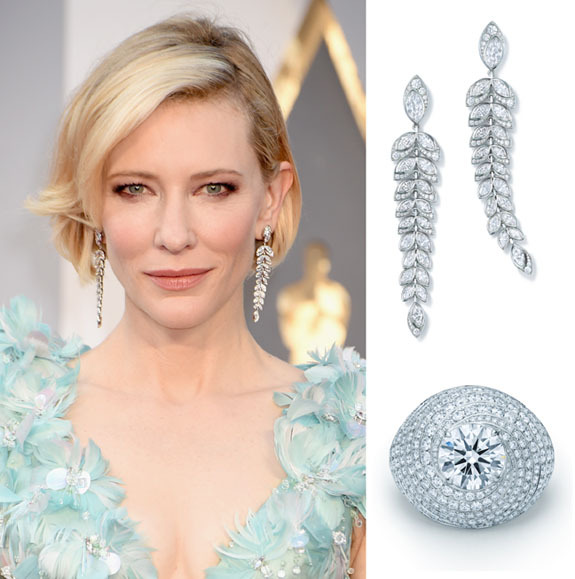 • Cate Blanchett, a Best Actress nominee for Carol, wore platinum by Tiffany & Co. Her ensemble included drop earrings with marquise and round diamonds ($125,000), a starfish cuff with round diamonds and a ring with a 2.30-carat round center diamond surrounded by a swirl of round diamonds ($110,000). • Charlize Theron turned heads in a show-stopping 48.8-carat Secret Cluster Diamond Necklace by Harry Winston. The long platinum necklace was complemented by diamond cluster earrings (15.49 carats), cushion-cut diamond ring with micropavé (8.78 carats), micropavé diamond band and Queen ring with diamonds (7.44 carats). The platinum grouping was valued at $3.7 million. • Reese Witherspoon wore an impressive suite of platinum jewelry by Tiffany & Co., which included a pair of earrings, three platinum bracelets and one platinum ring. 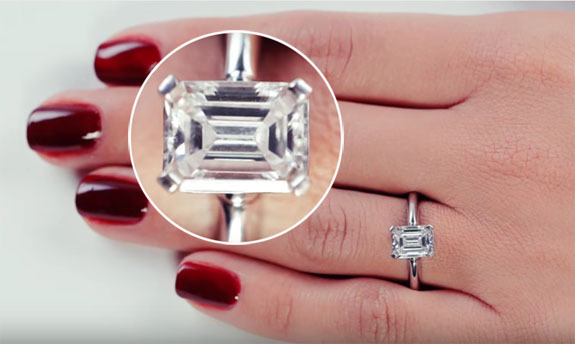 The $1 million grouping included a ring featuring an emerald-cut 7.49-carat tsavorite with diamond accents. • Jennifer Garner was decked out in a platinum ensemble by Neil Lane. She wore four platinum-and-diamond bracelets (150-carats, priced at $2.5 million), swirl drop earrings with diamonds and emeralds (10 carats), emerald-cut diamond ring (10 carats) and two additional platinum-and-diamond rings. • Presenter Priyanka Chopra wore a beautiful pair of diamond drops set in platinum by Lorraine Schwartz. The earrings boasted a total weight of 50 carats and were valued at $3.2 million. 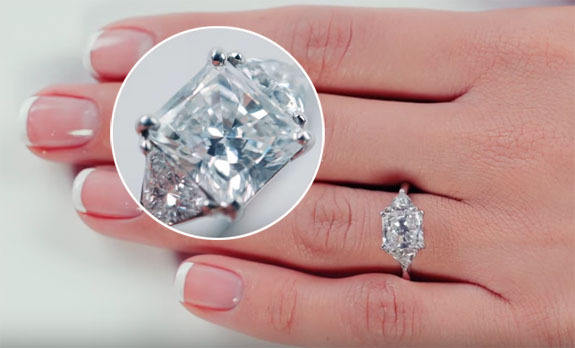 She also wore three platinum rings with the following total weights and values: 22 carats ($3.4 million), 10 carats ($850,000) and 8 carats ($300,000). • Lady Gaga, who performed the Oscar-nominated song “Til It Happens to You,” wore more than $8 million worth of platinum jewelry, including emerald-cut diamond drop earrings from designer Schwartz. Celebrities photos courtesy of Platinum Guild International. Photo credits: Getty Images. Cate Blanchett jewelry. Photo credit: Tiffany & Co. 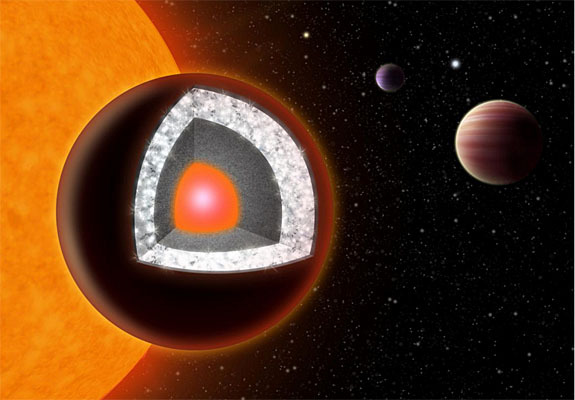 Using the Wide Field Camera on board the Hubble Space Telescope, a group of UK researches were able to add evidence to the theory that super-Earth 55 Cancri e — which revolves around a star 40 light years away — is, indeed, a "diamond planet." 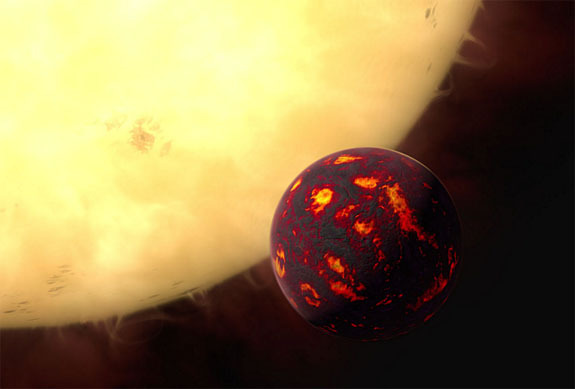 Back in 2012, Yale astrophysicists estimated that the carbon-based super-planet was about two times the size of Earth, eight times more dense and had a surface temperature of 3,900 degrees Fahrenheit. The presence of carbon, combined with high density and extreme heat create the perfect conditions for creating diamonds. They speculated that one-third of the planet could be composed of pure diamond. Taking a stab at the potential value of a diamond planet, a Forbes columnist did the math and came up with a value of $26.9 nonillion. That's $26.9 followed by 30 zeros. Sadly, the prospects of claiming that fortune are unlikely because of the intense heat, poisonous atmosphere and inconvenient distance of 230 trillion miles. Located in the northern constellation of Cancer, the diamond planet's host star is clearly visible with the naked eye. The Hubble Space Telescope, which was launched into low Earth orbit back in 1990, continues to unveil chemical curiosities throughout the universe. In the case of 55 Cancri e, the Wide Field Camera was able to detect the presence of hydrogen cyanide among the hydrogen and helium gases swirling around the planet. Hydrogen cyanide is an indicator that carbon compounds may also make up part of its atmosphere. The findings were announced by an international team, led by scientists from University College London (UCL) in the UK. A complete report will be published in the Astrophysical Journal. 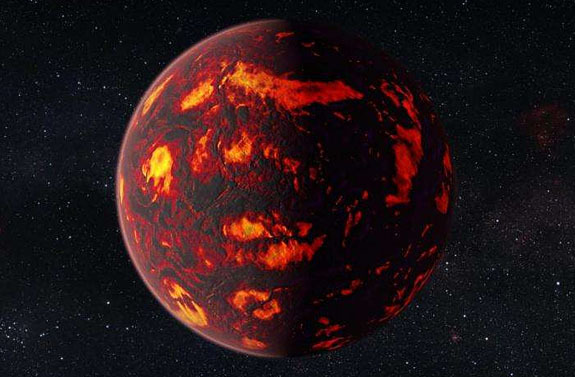 “This is a very exciting result because it’s the first time that we have been able to find the spectral fingerprints that show the gases present in the atmosphere of a super-Earth,” explained Angelos Tsiaras, a PhD student at UCL, who developed the analysis technique along with his colleagues Ingo Waldmann and Marco Rocchetto. 55 Cancri e is considered an unusual super-Earth because it orbits very close to its parent star. A year on 55 Cancri e lasts for only 18 hours. Images courtesy of ESA/Hubble, M. Kornmesser; Haven Giguere, Yale. When Lucapa unveiled an immense 404-carat diamond to the world last month, the company's chairman guessed that the pride of the Lulo Diamond Project in Angola would sell for about $14 million. On Monday, chief executive Stephen Wetherall proudly announced that the mining company's prized gem netted $16 million, or $39,580 per carat. The buyer was not revealed. In February, Lucapa chairman Miles Kennedy had told ABC Australia that experts at his company were having trouble calculating the gem's value due to its unusual size. The chemically pure, Type IIa gem weighs 2.8 ounces, measures 2.7 inches across and boasts a D color. "The sale of a single diamond for $16 million underlines the huge potential of the Lulo diamond field to regularly produce gems which are both large and of world-class quality, said Wetherall. Kennedy had noted that, over the past six months, the Lulo diamond fields in Angola have yielded more than 110 diamonds greater than 10.8 carats in weight. Four tipped the scales at more than 100 carats. The nearly $40,000 per carat achieved by the mammoth gem was a record for any white diamond recovered from Lulo. 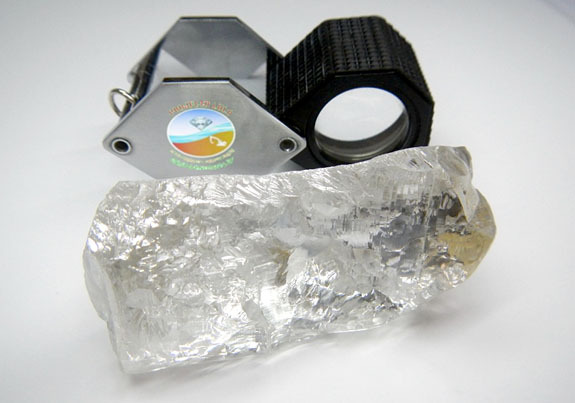 It's also the largest diamond ever found in Angola (the previous record holder weighed 217.4 carats) and the largest ever recovered by an Australian-based mining company. The Lulo Diamond Project is a relatively new endeavor among partners Lucapa, Endiama (the national mining company of Angola) and private Angolan partner Rosas & Pétalas. Mining operations commenced in 2015. The alluvial diamond mining operations are located on an extremely remote parcel of pristine ground more than 430 miles from the coast. "We look to the future with tremendous excitement at Lulo as we continue mining these exceptional alluvial diamond areas, growing our alluvial mining capability and advancing the kimberlite exploration program to locate the primary source or sources of these gems," noted Wetherall. Welcome to Music Friday when we bring you great new tunes with jewelry, gemstones or precious metals in the title or lyrics. Today, the British rock band Coldplay compares the forging of a new relationship to the formation of diamonds deep within the Earth in a song called "Adventure of a Lifetime." It's about finding love and feeling alive again. 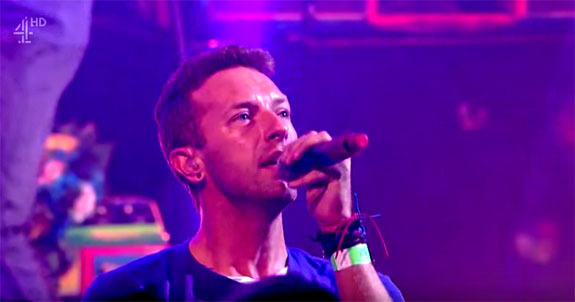 Coldplay frontman Chris Martin sings, "Turn your magic on / To me she'd say / Everything you want's a dream away / Under this pressure, under this weight / We are diamonds." 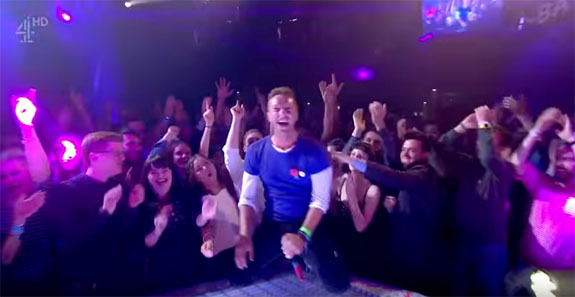 "Adventure of a Lifetime" is the lead single from Coldplay's A Head Full of Dreams album, which was released in November of 2015. The album signals a change of tone for Martin, whose previous work was downbeat and broody — reflecting his breakup with actress Gwyneth Paltrow. Writing for pop music website Idolator, Bianca Gracie and Robbie Daw called the colorful and energetic "Adventure of a Lifetime" the "best Coldplay single in seven years" and described the song as "incredibly vibrant in an almost childlike, blissful way that gives such an energetic rush." The song was co-written by Martin and band members Guy Berryman, Will Champion and Johnny Buckland. In an interview with SiriusXM radio, Martin explained that the song was inspired by a classic Guns N' Roses' rock riff. "I'd been begging Jonny, our guitarist, for years to make a riff that I like as much as 'Sweet Child O' Mine' by Guns N' Roses," said Martin. "Then he showed me that one, and I was like, 'That's it.' So those elements all came together, and we just wanted to kind of embrace our love of joyful music and sort of let it free." "Adventure of a Lifetime" peaked at #1 on the U.S. Billboard Alternative Songs chart and #13 on the U.S. Billboard Hot 100. It was also an international hit, charting in 22 countries. The album earned the #2 position on the U.S. Billboard 200 chart and a nomination for British Album of the Year. With more than 80 million records sold worldwide, Coldplay ranks as one of the world’s best-selling music groups. In December 2009, Rolling Stone readers voted the group the fourth-best band of the 2000s. The group has earned five MTV Video Music Awards, seven Grammy Awards and 31 Grammy nominations. Written by Guy Berryman, Jonny Buckland, Will Champion and Chris Martin. Performed by Coldplay. Images: Screen captures via YouTube. Hey, March babies. Congratulations, your official birthstone is the beautiful aquamarine. 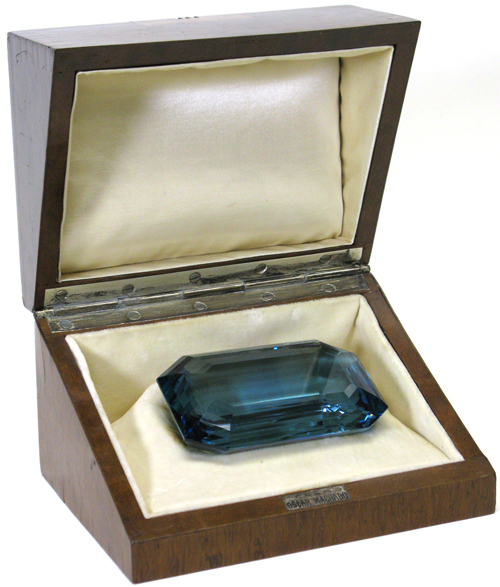 Did you know that one of the largest and most famous aquamarines of all time — a 1,298-carat wonder — was gifted to First Lady Eleanor Roosevelt by Brazilian President Getúlio Vargas nearly 80 years ago? It now resides in the Franklin D. Roosevelt Presidential Library and Museum in Hyde Park, N.Y.
FDR had just won his second presidential election in November of 1936, when he and the First Lady decided to embark on a month-long "Good Neighbor" cruise to South America. 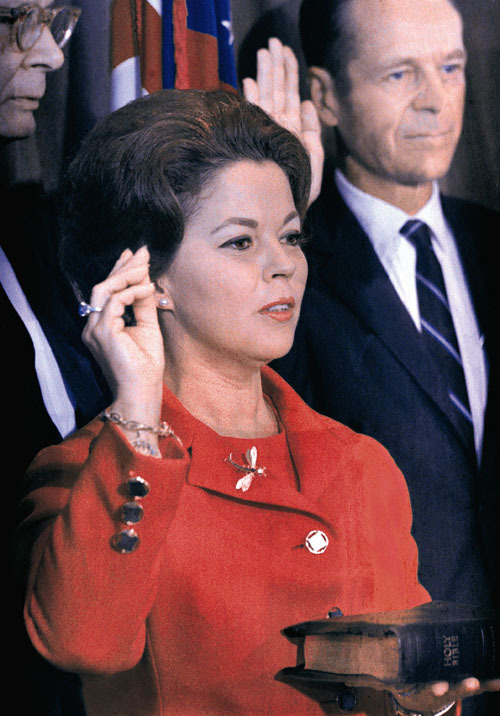 When the cruiser USS Indianapolis landed in Rio de Janeiro, the Brazilian president and his wife presented Eleanor Roosevelt with the remarkable stone from Vargas' own collection. 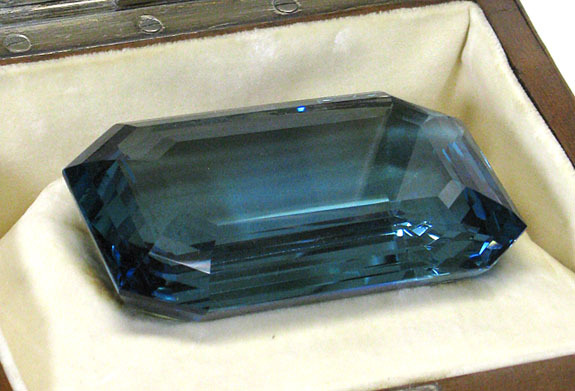 At the time, the bluish-green rectangular step-cut gem was the world's largest cut aquamarine. Mined in the Brazilian state of Minas Gerais, the gem was cut from a rough stone that weighed 6,500 carats (2.86 pounds). The rough had been shipped to Amsterdam, where cutter Gustav Reitbauer successfully produced two world-class gems — the one given to the First Lady, and a second, at 865 carats, that was sold to Jagatjit Singh, the Maharaja of Kapurthala (India). The First Lady's gift was presented in an art deco box, which was custom made by jeweler Casa Oscar Machado. Even today, the gem remains in its original presentation box. Like many famous gemstones, Eleanor Roosevelt's aquamarine was the subject of intrigue and controversy. In 1947, two years after FDR's death, syndicated columnist and radio personality Drew Pearson accused the former First Lady of trying to sell the aquamarine. Apparently, the columnist had learned that she had attempted to discover the gem's value. The controversy went away quietly when she donated the gem to the Roosevelt Library. 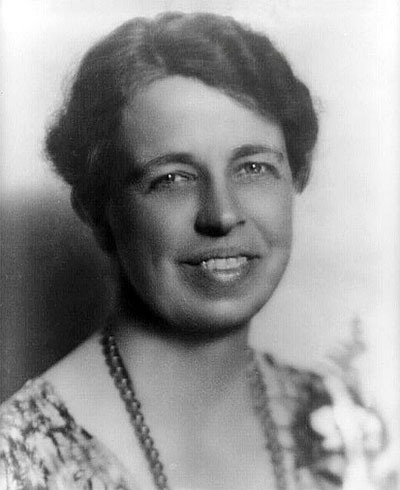 The First Lady passed away in 1962 at the age of 78. 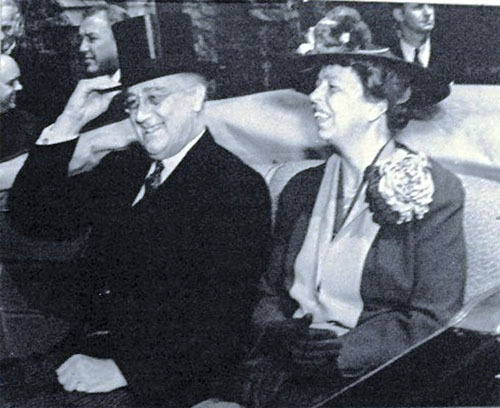 Credits: Aquamarine images courtesy of the Franklin D. Roosevelt Presidential Library and Museum, Hyde Park, New York; FDR and First Lady photo, by Franklin D. Roosevelt Presidential Library Digital Archives [Public domain], via Wikimedia Commons; Eleanor Roosevelt photo, public domain, via Wikimedia Commons. South of the border on Mexico's Yucatan Peninsula, women love to make a fashion statement with the Maquech Brooch — a live beetle decked out with colorful rhinestone jewels and gold chain. 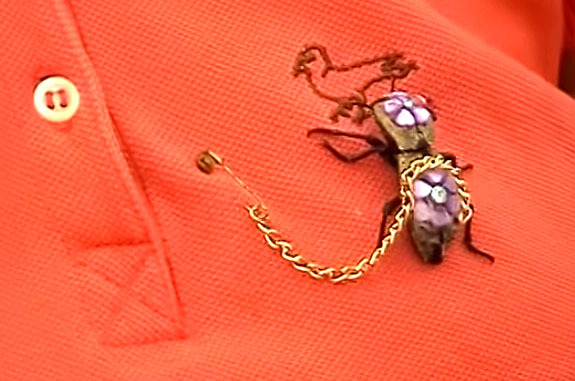 The docile, wingless bug crawls on the wearer's shirt within range of its three-inch-long chain "leash" that's attached with a decorative safety pin. If bugs make you jumpy, it’s hard to imagine the appeal of wearing a creepy-crawly beetle as a "pet-cessory." 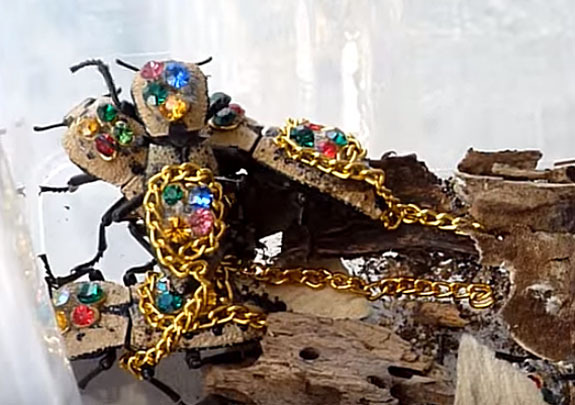 One might even find it disheartening that the creatures are destined to go through their lives as animated bling, but the bugs don't seem to mind having beautiful baubles glued to their backs. They generally live for up to three years on a diet of apples and wet, rotted wood. The bejeweled beetles have played a romantic role in Yucatan culture for centuries. According to legend, a Mayan princess was not permitted to marry a prince from a rival clan, and when they were discovered, the lover was sentenced to death. 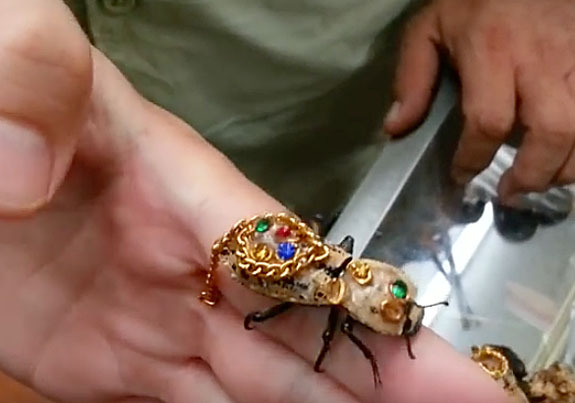 Recognizing their plight, a shaman changed the man into a shining beetle that could be decorated and worn over the princess's heart as a reminder of their eternal bond. Tourist shops in the Yucatan have been selling Maquech jewelry since the 1980s. Today, the glittery crawlers sell for about $10. 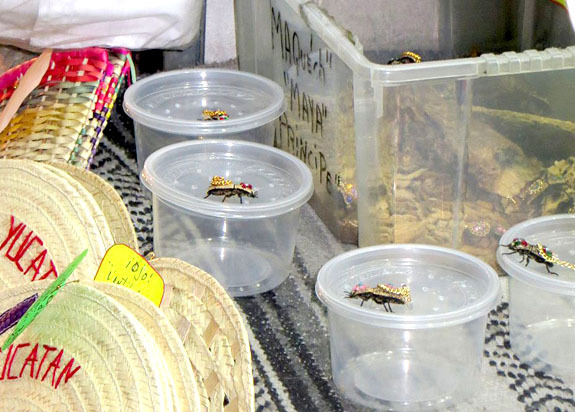 U.S. tourists may not bring the blingy beetles over the border. 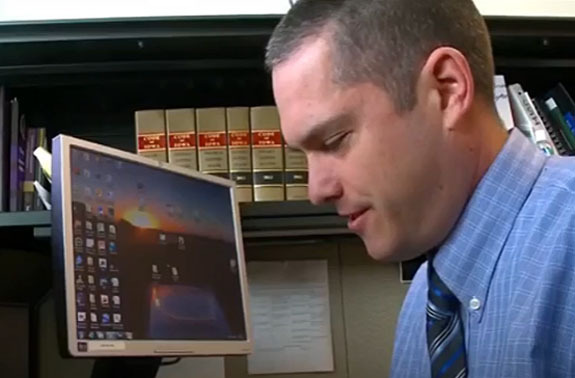 Defying the law carries a fine of up to $500. According to Smithsonian.com, several confiscated specimens are glittering among the Coleoptera collections of the National Museum of Natural History in Washington, D.C.
"It doesn't take much to keep them happy," Warren Steiner, an emeritus beetle researcher at the Natural History Museum, told Smithsonian.com. "They need to eat a little starchy material, but they can survive for a long time with no water. The adults are often found under logs, bark stumps, that kind of thing. They're wood scavengers, and really sluggish. They usually play dead when you find them." Finding and collecting Maquech beetles is the work of "Los Maquecheros," a group of men who specialize in sifting through decomposing vegetation on the forest floor. Interestingly, the ancient Egyptians may have been the first people to wear insects as jewelry. Historians believe that Egyptian soldiers wore scarab beetles into battle as the beetles were considered to have supernatural powers of protection against enemies. You know it's going to be a bad day when you've misplaced your best diamond jewelry and your toddler says he "flushed Mommy's pretties." 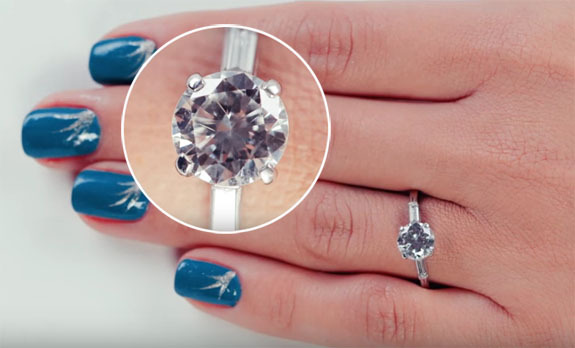 That's the story of British Columbia resident Dani Jacobsen, whose two-year-old son, Cohen, scooped up his mom's engagement ring, wedding band, diamond earrings, diamond pendant and diamond necklace and flushed them down the toilet as she was preparing his bath. Cohen was going through his "flushing" stage, and only one day earlier he tried to flush a whole apple down the commode. Dani had removed her precious keepsakes in preparation of giving her son a bath, but when bath time was over, her jewelry was out of site. She and her husband, David, searched the house, but to no avail. Finally, they asked Cohen if he had seen Mommy's "pretties." Cohen took his mom's hand, led her to the toilet and repeated the phrase, "flushed Mommy's pretties." Dani's husband, an underground pipe layer by trade, removed the toilet and even crawled under the house to take apart the pipes leading from the toilet. 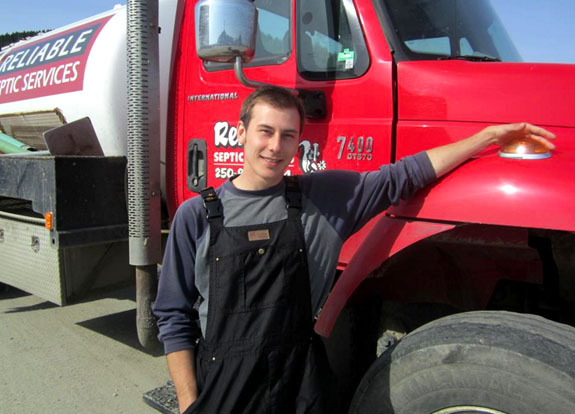 When that effort failed, the couple called in the professionals at Reliable Septic Services. Co-owner Jacob Starnyski and David put on their Hazmat suits and waded waist deep in the stinky septic tank. After hours of pumping, screening and sifting, the jewelry still could not be found. That was 2013, and Dani was certain that her engagement ring and other diamond jewelry were gone forever. She was particularly fond of the Journey Diamond Pendant, a gift from her husband when they were going through some difficult emotional times. But, recently, as the couple was preparing to sell their house, they decided to give the search one more shot. Again, Starnyski found himself in the now-familiar mucky septic tank, and once again he would pump out the waste while screening and sifting. 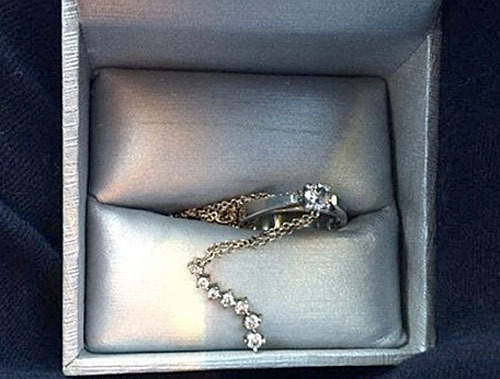 "Once I got to the bottom, I took my time a little more, and lo and behold there was the ring," Starnyski told CBC News. Wrapped around the engagement ring was Dani's cherished Journey Diamond Pendant. Later, he also found the diamond necklace. Although the wedding band and diamond earrings remain missing, Dani was still overwhelmed by the success of the stinky expedition. 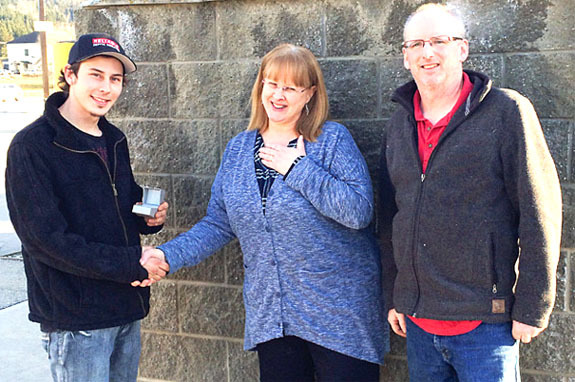 Dani and her family had already moved 330 miles away to their new town of Nanaimo when the jewelry was found, so her parents, Donna and Doug Howard, stood in to accept the recovered jewelry from Starnyski on their daughter's behalf. Credits: Jewelry shot and group shot courtesy of Dani Jacobsen. Jacob Starnyski shot via Facebook/reliablesepticservicesinc. An Iowa sheriff left no stone unturned in his relentless effort to reunite a unique custom ring with its rightful owner. 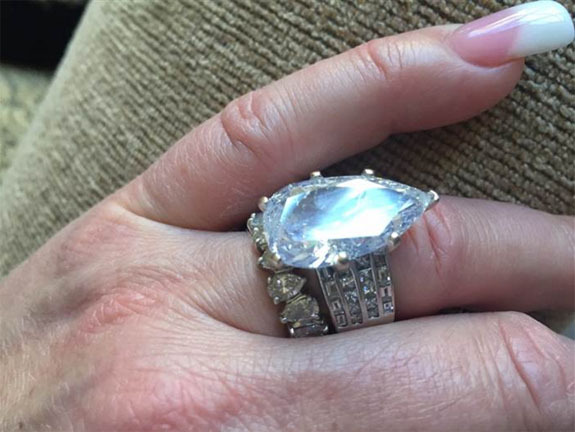 On Super Bowl Sunday, Good Samaritan Angela Allen was shocked to find the valuable bauble lying on the ground in the parking lot of a gas station in Slater, a small town about 20 miles north of Des Moines. Recognizing both the tangible and sentimental value of the ring, she turned it over to the Story County Sheriff, Aaron Kester. 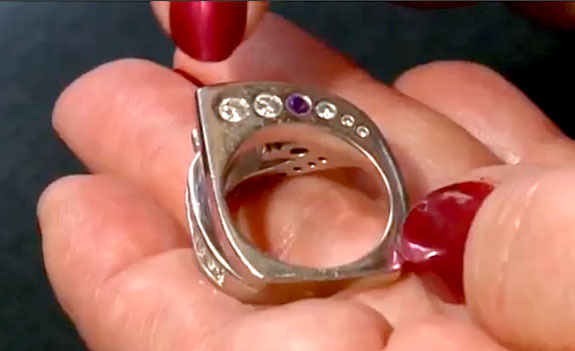 The unusual ring, which features two large diamonds and a rim of graduated smaller ones punctuated by a single amethyst, had been the prized possession of Sharon Soder. The largest of the graduated stones was from her mother's wedding ring and all the others held special meaning. "There's no other ring like it," she said. Soder had no idea where she lost the ring. She and her husband tore through her home, checking the laundry, under the beds, everywhere. Meanwhile, Sheriff Kester was on a mission to solve the mystery. "There were no maker marks inside, so there really wasn't much to go on,” he said. The sheriff decided to personally visit every jeweler in the county to see if any of them had designed the ring. When that strategy failed, he widened his net to include every jeweler in Des Moines. Still, no luck. 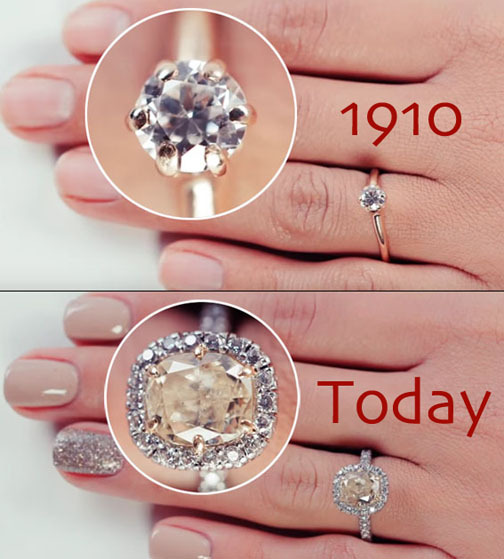 Then he texted a picture of the ring to a customer jeweler, who confirmed that he has designed it. The jeweler also had documentation revealing the ring's owner. 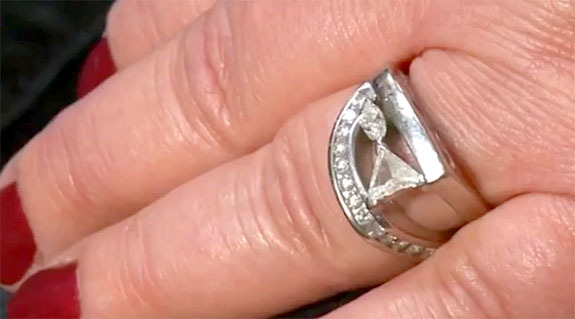 Three weeks after losing her ring, Soder received an unexpected call from Sheriff Kester. 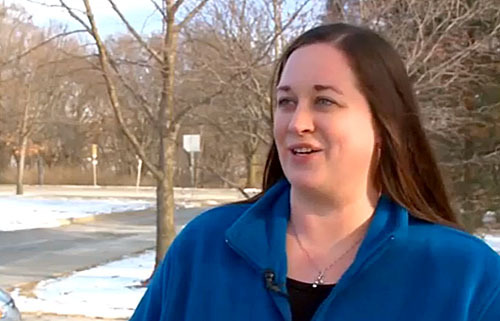 “I'm like, 'Oh my gosh!’ It was like a miracle,” Soder told Local 4 News. When Sheriff Kester was asked about his heroic efforts to return the ring to Soder, he attributed them to "Iowa values." 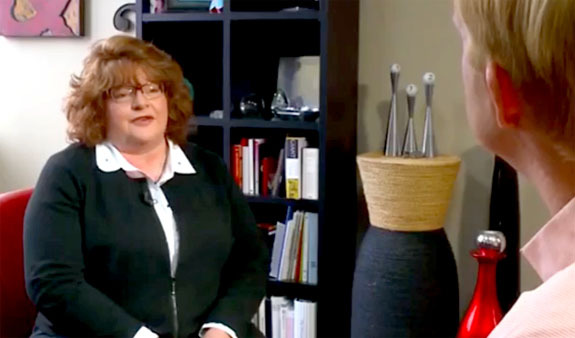 And when Good Samaritan Allen was asked about her motivation to do the right thing instead of keeping the ring for herself, she answered, "That's why I live in Iowa." With a wry smile, Kester recounted: "Yeah, I bent our policies and allowed her to give me a hug." Images: Video captures via ourquadcities.com/Local4News. Welcome to Music Friday when we like to bring you throwback tunes with jewelry, gemstones or precious metals in the lyrics or title. 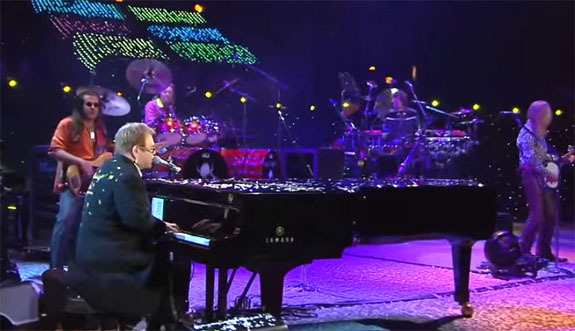 Today, Stevie Wonder performs his funky rendition of "Pearl," a 1969 song about the sweetest girl in the world. Wonder tells us that no matter how far he travels or how far he roams, there's no girl in the whole wide world as sweet as the girl he's got waiting for him back at home. He sings, "Let me tell you, I love that girl so / And I call that girl Pearl / Sweetest girl in the world." Written by Richard Morris, "Pearl" was the seventh track on Wonder's memorable album My Cherie Amour, which spawned a number of hits, including the title track and "Yester-Me, Yester-You, Yesterday." He was discovered by Ronnie White of the Miracles at the age of 11 and was quickly signed to a five-year Motown contract by CEO Berry Gordy. Billed at Little Stevie Wonder, the singer/songwriter/musician was an instant sensation. Wonder and his mother received a stipend to cover their expenses, and the young performer got $2.50 in spending money per week. 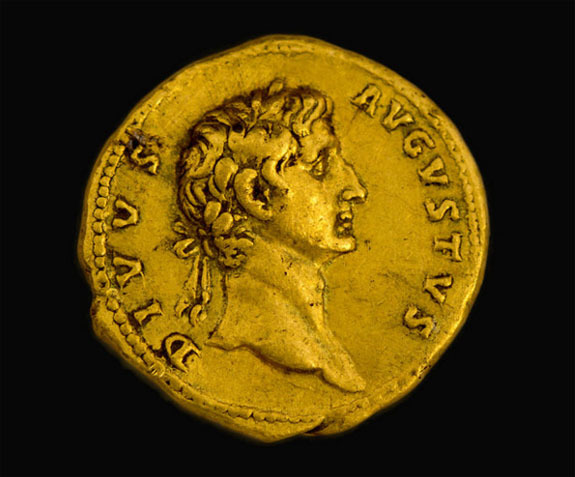 The rest of his earnings were held in trust until he turned 21. Wonder plays the piano, synthesizer, harmonica, congas, drums, bongos, organ, melodica and Clavinet. 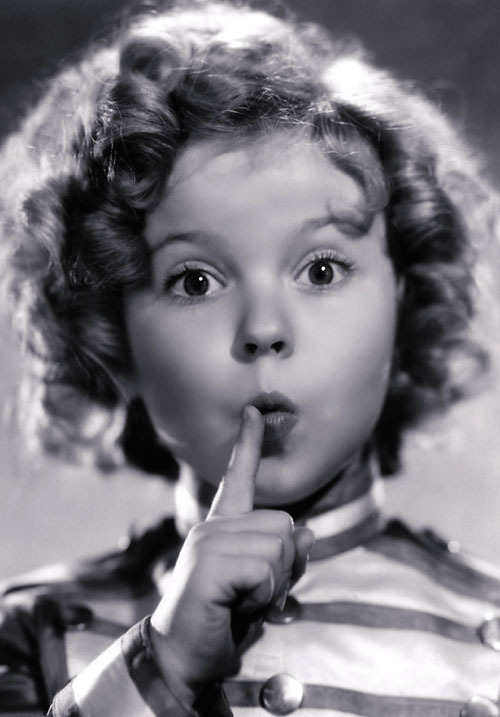 Now 65, Wonder has performed for more than five decades. Over that time, he has amassed 30 U.S. top 10 hits and received 25 Grammy Awards, the most ever awarded to a male solo artist. He has sold more than 100 million records worldwide and Rolling Stone magazine named him the ninth greatest singer of all time. He is a member of both the Rock and Roll and Songwriters halls of fame. We hope you enjoy the audio track of Wonder's performance of "Pearl." The lyrics are below if you'd like to sing along. Written by Richard Morris. 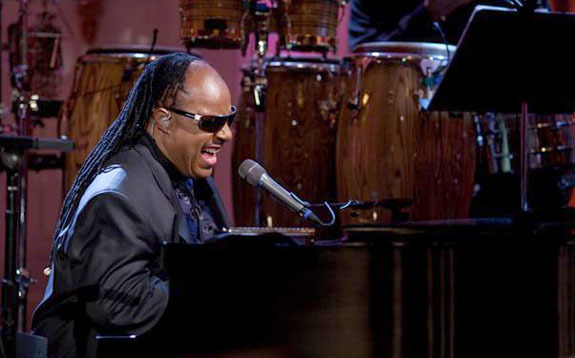 Performed by Stevie Wonder. E! News host Maria Menounos and her boyfriend of nearly 20 years, Keven Undergaro, got engaged last Wednesday on-air during Howard Stern‘s SiriusXM radio show. 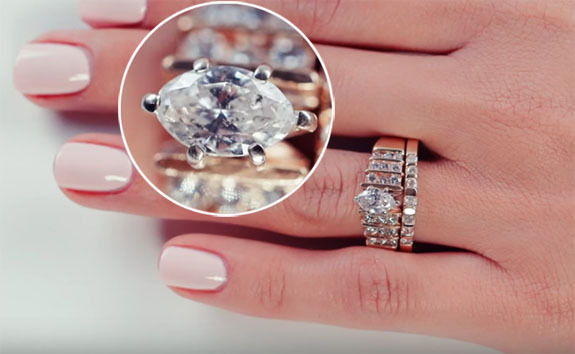 Undergaro got down on one knee and presented Menounos with a one-of-a-kind halo-style engagement ring that features a Signature Stone hidden underneath. Menounos appeared on the radio show to promote her new book, The EveryGirl’s Guide to Cooking. 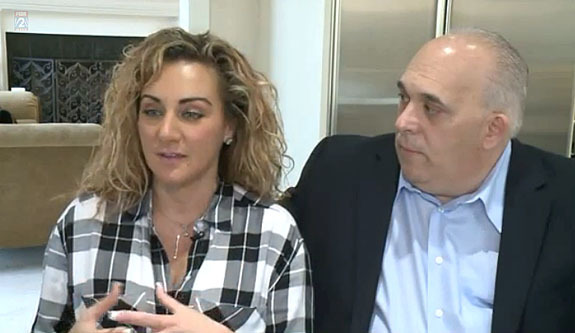 Just as she had completed her interview with Stern, boyfriend Undergaro, a TV producer, took the microphone, prompting Menounos to ask if he was about to propose. He initially said, "No," but then went on to tell Stern's audience about the emotional ups and downs the couple had experienced over the course of almost two decades. Then he addressed Menounos directly. "It reminds me just how much I do love you," he said. "And although I said that this isn't a proposal, I want to ask you something, Maria." "Would you make me the happiest man on earth?" Undergaro asked. "And would you marry me?" 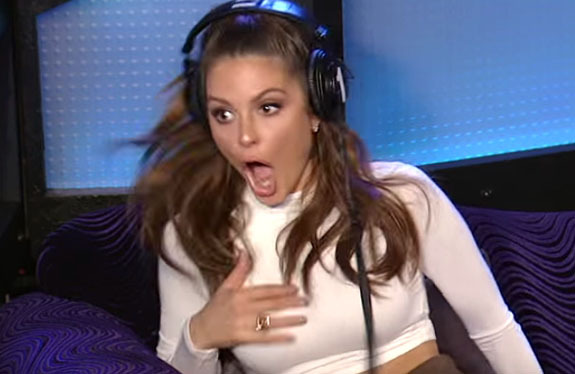 Menounos, 37, was clearly shocked by the surprise proposal, stating, "Are you friggin' kidding me right now? Is this a joke?" "It's not a joke," Keven replied. "This I wouldn't joke about. I love you so much and this show's meant so much to both of us. Why not make it official now? Will you, honey? Will you accept?" "Oh, my God! Yes! Yes! Yes! Yes! Of course!" she exclaimed, as she stared at her new ring. "Oh, my God! I can't even believe this is happening." 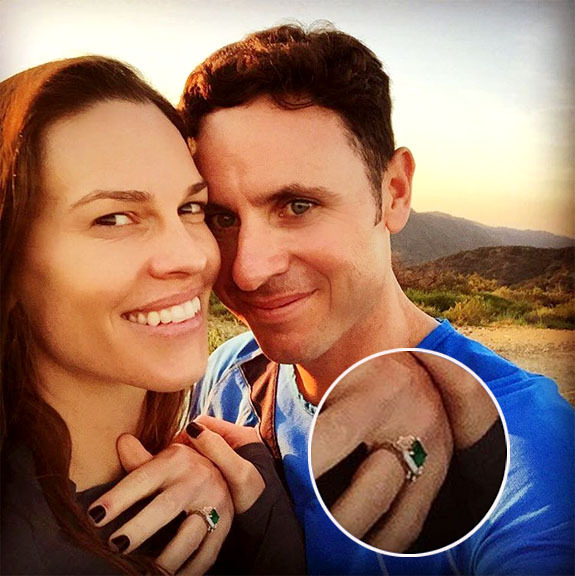 French jeweler Jean Dousset, whose client list includes Amy Adams and Eva Longoria, dished to PeopleStyle about the details of ring he designed with the assistance of Undergaro. The ring boasts an Ideal Cut round center stone set in a "Seamless Halo" that is adorned with 220 intricately set brilliant-cut diamonds. The smaller diamonds encircle the center stone and cascade down the band. 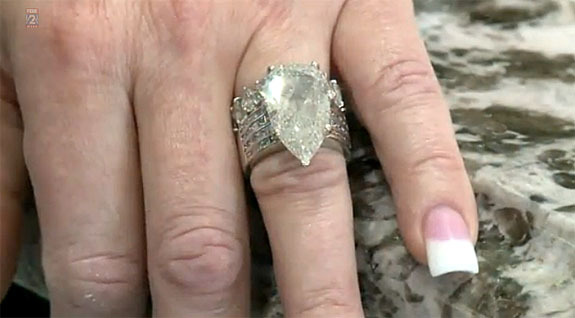 "Keven chose to add personal elements to the ring by including a Signature Stone hidden underneath," the designer told E! News. "The choice of color and origin of the stone adds thoughtful detail only he and Maria will know and see." We're assuming the gem is flush-set inside the band. 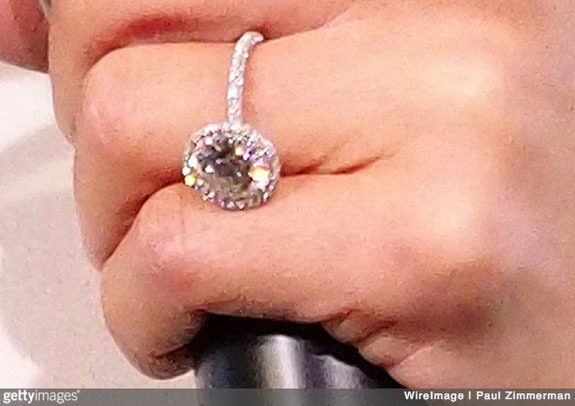 On Instagram, Menounos posted a photo of her and her boyfriend showing off the new ring. The caption reflected her sheer joy... "omg this happened!!!!!!! thank you @sternshow @bethostern so much for everything. I'm in utter shock! And thank u my love for 19 amazing years. Can't believe we are engaged!!!!" Images: Screen captures via YouTube/The Howard Stern Show; Instagram/The Howard Stern Show; Getty Images/WireImage/Paul Zimmerman. Less than five months after "Blue Moon" shattered the record for the world's priciest diamond, another "rare and superb" blue diamond — the "De Beers Millennium Jewel 4" — will be looking to make its own headlines at Sotheby's Hong Kong in April. Described as internally flawless and weighing 10.10 carats, the oval-shaped fancy vivid blue "De Beers Millennium Jewel 4" is expected to fetch between $30 million and $35 million when it hits the auction block on April 5. Slightly larger than an almond, it's the largest oval fancy vivid blue diamond ever to appear at auction. If the gem achieves its high estimate, it will become the highest priced diamond ever sold in Hong Kong. 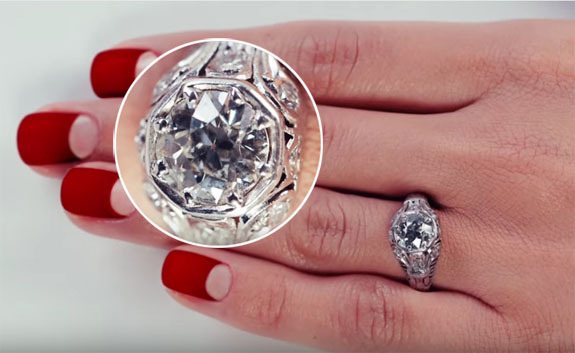 The current record holder is a 118-carat white diamond that fetched $30.6 million in 2013. 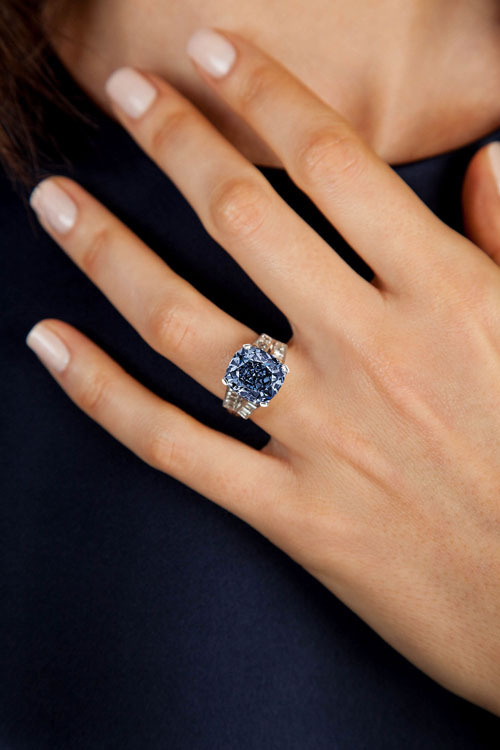 It's almost certain the "De Beers Millennium Jewel 4" will not surpass the $48.5 million paid at Sotheby's Geneva for the 12.03-carat cushion-shaped internally flawless "Blue Moon" (now called "Blue Moon of Josephine"). "Blue Moon" is the record holder for the highest price ever paid for a diamond of any color, and for the highest price paid per carat for any diamond ($4.02 million). Hong Kong billionaire Joseph Lau purchased the stone to honor his 7-year-old daughter, Josephine. Despite the fanfare surrounding its larger cousin, the "De Beers Millennium Jewel 4" is famous in its own right for being one of 12 rare diamonds that formed the De Beers Millennium Jewels collection, which was unveiled by De Beers in 2000 in celebration of the dawn of the new century. The "De Beers Millennium Jewel 4" was put up for auction by an Asian private collector. The vibrant blue stone was sourced at South Africa's Cullinan Mine and gets its blue color from boron impurities in the chemical makeup of the diamond. 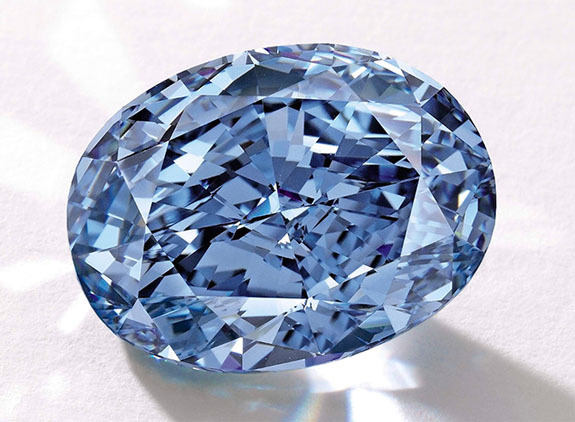 Blue diamonds are extraordinarily rare and typically yield the highest prices at auction. Yeow told AFP that there are no more than a dozen or so fancy vivid blue diamonds over 10 carats in the world. 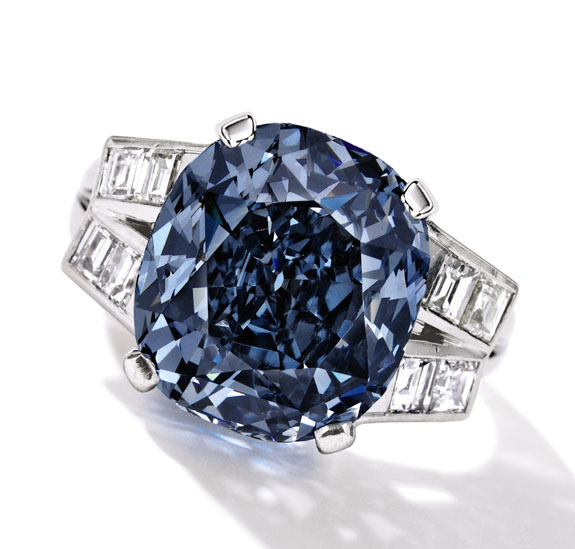 Sotheby's regularly handles its highest-profile gemstones like rock stars and this one is no exception. The "De Beers Millennium Jewel 4" will be touring New York, London, Geneva, Singapore, Taipei and Hong Kong in a high-profile campaign leading up to the auction, which will take place at the Hong Kong Convention and Exhibition Centre. 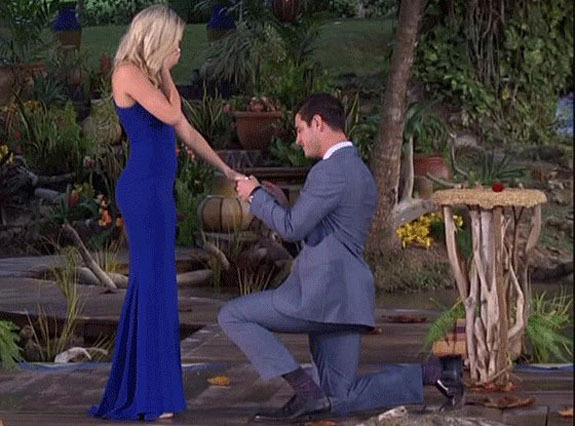 Nearly 10 million fans of The Bachelor tuned in Monday night to see Ben Higgins propose to Lauren Bushnell with a $100,000 vintage-style engagement ring. The stunning platinum ring features a 3-carat emerald-cut center stone surrounded by a halo of round diamonds and is flanked by two stepped baguette diamonds. The hand-crafted ring by designer Neil Lane has an openwork gallery and a diamond total weight of 4.6 carats. An insider told E! News that Higgins chose the vintage look because it reflected his "old-fashioned values." The 26-year-old Higgins, a software sales rep, had been emotionally torn between bachelorette contestants Bushnell and Joelle "JoJo" Fletcher. In the previews of the 20th season finale, Higgins was seen telling both women that he loved them. But, in the end, it was Bushnell, a 24-year-old flight attendant, who stole his heart. The disheartened Fletcher can't be called a loser, though, because she was named as next season's "Bachelorette." 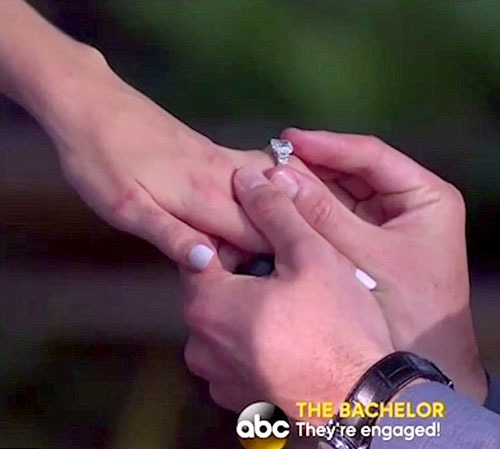 All eyes were on Higgins and the diamond engagement ring in Monday night's dramatic climax of The Bachelor. 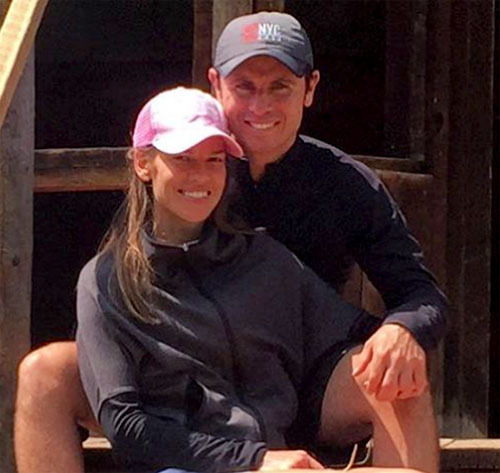 "I came into this honestly feeling unlovable, that I couldn't be loved or that I was never going to find that person to love me fully," Higgins said in the lead up to his marriage proposal. "And then we go through this experience — a journey that's full of goodbyes." He continued, "Lauren, I never want to say goodbye to you. I want to wake up every morning and kiss you on the face. I want to go to bed at night and know that in the morning I'm going to wake up to the most beautiful woman that I've ever laid eyes on. My desire from here on out is to live for you, commit to you, love you, hold you, kiss you a lot. Lauren, I want to spend the rest of my life with you." Then he took a deep breath, sighed and pulled a ring box from his breast pocket. Holding her hands to her face, Bushnell cried as Higgins got down on one knee and asked for her hand in marriage. 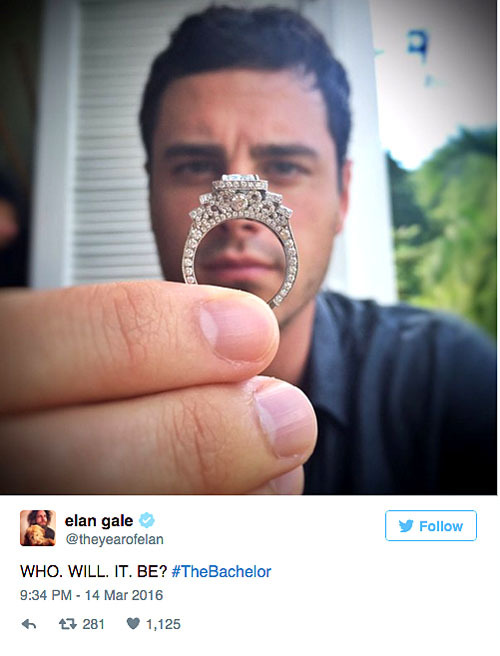 "Lauren, will you marry me?" She responded, "Ben! Yes, of course! This is the happiest day of my whole life." He placed the impressive ring on her finger and the couple embraced. 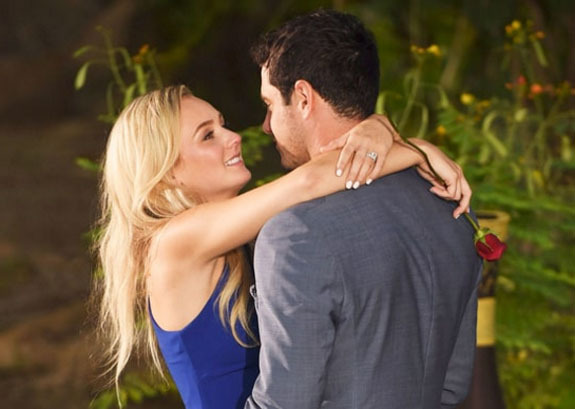 Higgins and Bushnell taped the finale weeks ago and their engagement had to be kept under wraps. 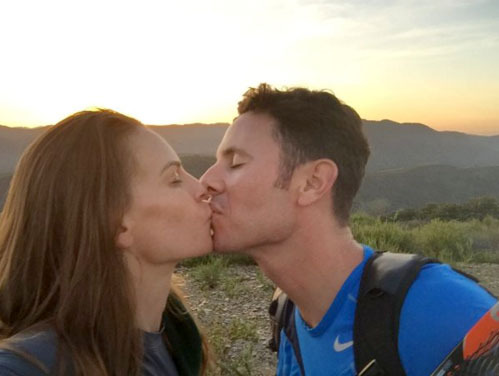 But, by Tuesday, the couple was interviewed during a live segment on ABC's Good Morning America and found themselves on the cover of People magazine. "I’m looking forward to just starting a normal life," Bushnell said. "We’ve been engaged, but secretly, for the last few weeks and so I’m excited to go on a date." Screen captures via ABC; Twitter/Elon Gale. Hey, romantic couples out there. If you missed an opportunity to propose to the love of your life on Christmas Day, New Year's Eve or Valentine's Day, you have another chance this weekend. Not only does Sunday, March 20, represent the vernal equinox (first day of spring), but it's also National Proposal Day. Conceived by John Michael O'Loughlin decades ago as a perfect time for procrastinating lovers to finally ask for their partners' hand in marriage, National Proposal Day has slowly become an accepted part of our holiday lexicon. O'Loughlin picked the vernal equinox as the ideal day for couples to make the ultimate commitment to each other because it's the special time of the year when day and night are equal lengths worldwide. O'Loughlin reasoned that this symbolizes "the equal efforts of the two required to comprise the successful marriage." If you're wondering if the autumnal equinox — another perfectly balanced day — would carry the same symbolism as the spring version, your hunch is right on. There is a second National Proposal Day on the first day of fall, September 22. The romantic O'Loughlin created National Proposal Day after watching his cousin wait years for a proposal that never came. He felt that a special day earmarked for proposals would put a fire under some partners who have waited a bit too long to pop the question. National Proposal Day is promoted as a worldwide event, and O'Loughlin encourages romantic couples to meet up with like-minded friends via social media using the hashtag, "proposalday." O'Loughlin, who registered the name Proposal Day!®, clarified that March 20 doesn't have to end with a proposal. It can be used, instead, to spark a conversation about a future proposal. Twice a year, in the lead up to National Proposal Day, O'Loughlin adds to the excitement by announcing the world's most eligible bachelor and bachelorette. This past fall, he chose John F. Kennedy's grandson, Jack Schlossberg, and British actress Emma Watson. This spring's most eligible guy and gal will be posted at the official Proposal Day!® website on the late evening of Friday, March 18. Welcome to Music Friday when we bring you outstanding songs with jewelry, gemstones or precious metals in the title or lyrics. Today, British rocker Billy Idol performs "Sweet Sixteen," a song inspired by the tragic love story of Edward Leedskalnin and the girl who left him at the altar. Those who have visited the mysterious Coral Castle in Homestead, Fla., know the story of Leedskalnin, a 26-year-old Latvian, who was engaged to be married to Agnes Scuffs in 1923. One day before their scheduled wedding, Scuffs, who was 10 years his junior, broke off the engagement. Devastated by their parting, Leedskalnin emigrated to the U.S., where he bought a piece of land in south Florida and for the next 25 years single-handedly sculpted 1,100 short tons of coral into a monument he called "Rock Gate Park." He dedicated to park to Scuffs, who he called his "Sweet Sixteen," but could never win her back. 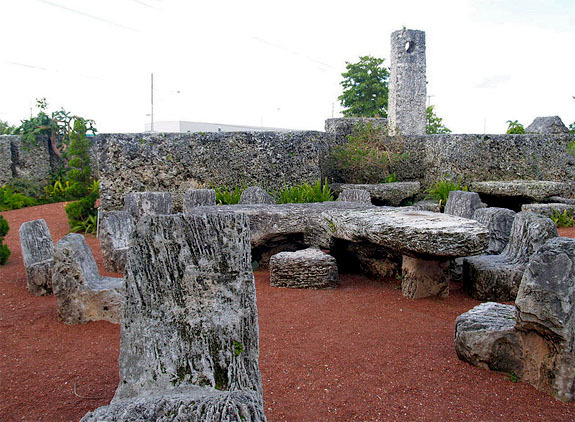 Idol visited Rock Gate Park, which had been renamed Coral Castle, in the early 1980s and was so intrigued by Leedskalnin's story that he decided to write a song about it. Idol seems to be channeling Elvis Presley as he sings, "I'll do anything / For my sweet sixteen / And I'll do anything / For little run away child / Gave my heart an engagement ring / She took ev'rything / Ev'rything I gave her / Oh sweet sixteen." Idol goes on to reference the incredible coral sculptures Leedskalnin built in her honor. Even to this day, a mystery surrounds how the amateur sculptor was able to carve the huge boulders and move them without any outside help. According to a contributor to Songfacts.com, framed photos of Idol's visit are featured in the Coral Castle gift shop. 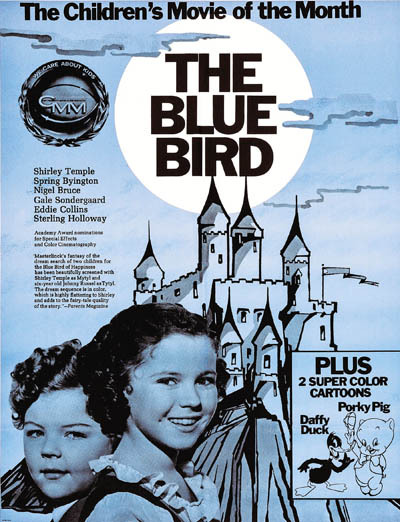 The attraction is on the National Register of Historic Places. "Sweet Sixteen" was the fourth track on Idol's Whiplash Smile album, which sold more than one million copies and peaked at #6 on the Billboard 200. The single reached #20 on the U.S. Billboard Hot 100. Idol was a key member of the MTV-driven "Second British Invasion" of the United States back in the early 1980s. Among his most popular songs from that era are "Dancing with Myself," "White Wedding," "Rebel Yell" and "Eyes Without a Face." 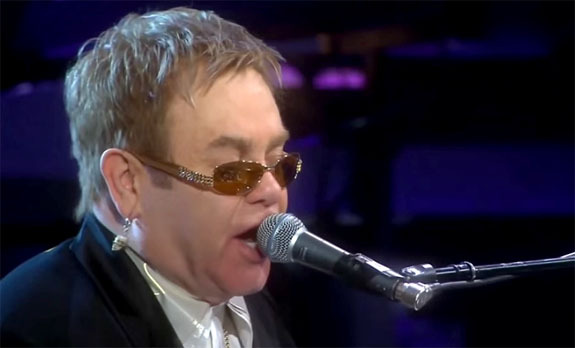 The 60-year-old rocker is still actively touring. Written and performed by Billy Idol. Gave my heart an engagement ring. Well, memories will burn you. For little run away girl. Yeah, sad and lonely and blue. Yeah to get up in the morning, get over you. Up in the morning, get over you. 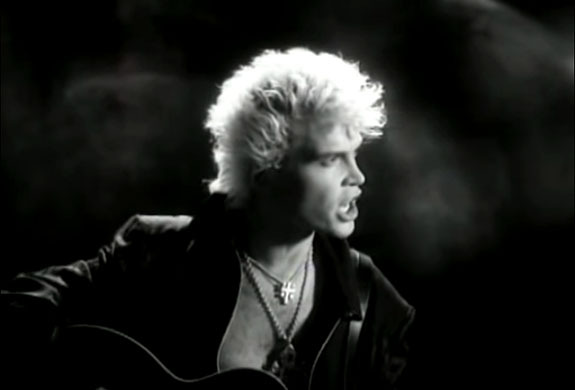 Image: Billy Idol screen capture via YouTube. Coral Castle photo by Christina Rutz [CC BY 2.0], via Wikimedia Commons. The last time a ruby this magnificent was offered for sale by a New York auction house, President George H.W. Bush was Time magazine's Man of the Year, Macauley Culkin was starring in Home Alone and M.C. Hammer was wearing parachute pants. Yes, we have to go back to 1990 to match the grandeur of the ruby that will headline Christie's Magnificent Jewels sale on April 20. The 15.99-carat "Jubilee Ruby" is a true rarity in its exceptional size, color and quality. The oval-shaped Burmese ruby, which is framed by white diamonds in a platinum and 18-karat yellow gold mounting by Verdura, is predicted to sell in the range of $12 million to $15 million. Back in October 1990, Christie's sold a 16.20-carat Burmese ruby. For the next 25-plus years, no gems of that size and quality would come up for sale. 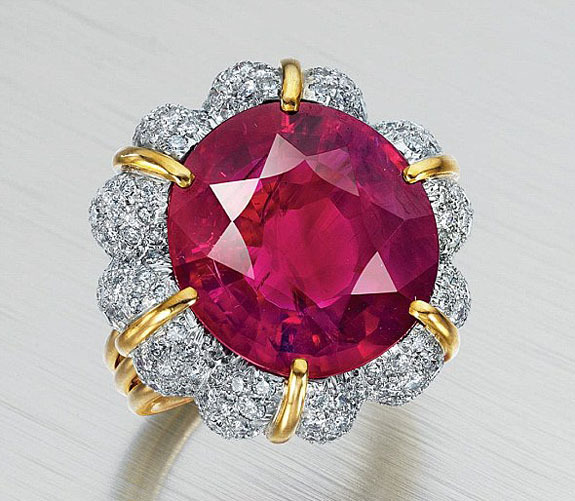 That's why Christie's is so excited to represent the "Jubilee Ruby." “Top quality Burmese rubies of over 15 carats are an absolute rarity in the world of colored gemstones, and the record price of $18.3 million achieved for the 15.04-carat 'Crimson Red Ruby' at Christie’s Hong Kong in December 2015 exemplified the voracious appetite of collectors for these gems," commented Rahul Kadakia, Christie's International Head of Jewelry. 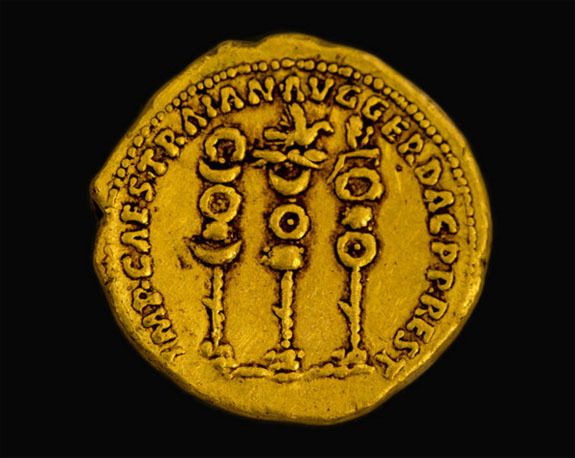 In a Christie's promotional video, the narrator states, "To say the 'Jubilee Ruby' is worthy of a king would be no exaggeration. Until the middle of the 19th century, only the Sovereign of Burma or an individual deemed worthy by him would have been allowed the privilege of possessing such a magnificent gemstone." The ruby's intense, saturated red color — often referred to as pigeon's blood red — is often associated with the gems mined in Burma's legendary Mogok Valley. Christie's explained that the land near the mine is rich in chromium, an element that gives the gems a natural fluorescence. This fluorescence makes the stone “come alive” and appear internally illuminated. While emeralds, sapphires and diamonds regularly appear on the market in extraordinarily large sizes, Burmese rubies greater than 15 carats in weight are uncommonly rare. 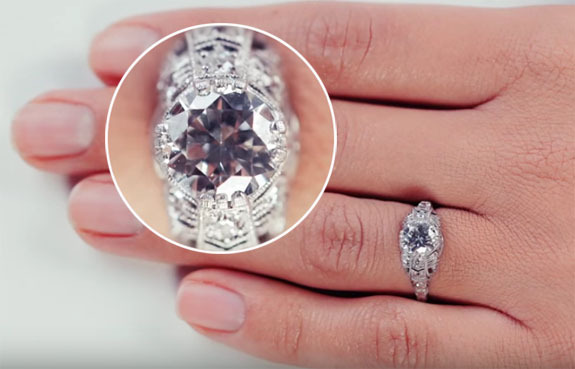 Notes the Christie's video, "To find an almost circular cut unheated gem weighing more than 15 carats with near perfect crystallization is the dream of every gemstone connoisseur." Other top lots at Christie's April 20 sale include a 10.07-carat fancy intense purple-pink diamond ring and a perfect D color, flawless round brilliant-cut diamond weighing 40.43 carats. 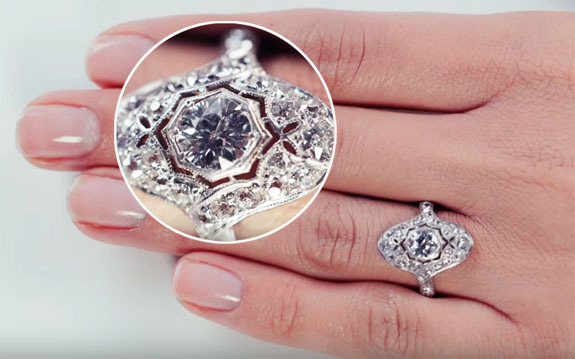 The purple-pink diamond ring could sell for as much as $12 million, while the flawless diamond is expected to sell in the range of $7 million to $10 million. All the items featured at the upcoming Magnificent Jewels auction will be on public view April 15 through April 19, at Christie’s Rockefeller Center galleries. 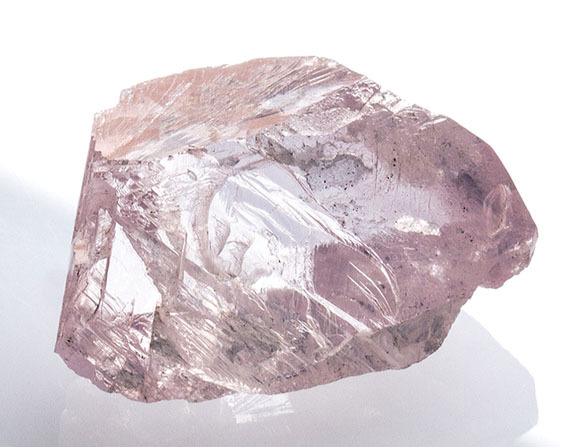 Petra Diamonds announced that it sold an exceptional 32.33-carat "bubblegum" pink rough diamond for a remarkable $15 million, or $463,965 per carat. The stone was sourced in Tanzania at Petra's legendary Williamson Mine, which has been producing gem-quality "bubblegum" pink diamonds for the past 76 years. 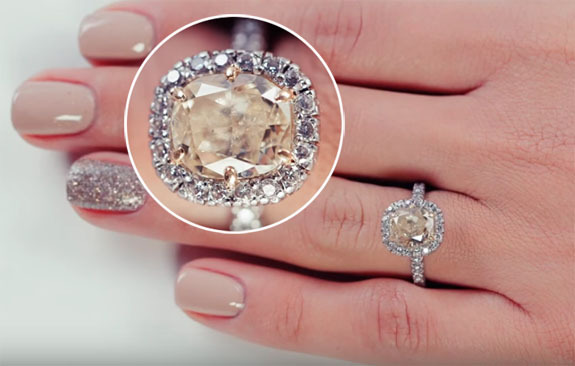 The diamond was purchased by Golden Yellow Diamonds on behalf of Israeli diamond manufacturer M. A. Anavi Diamond Group, a company specializing in colored diamonds. As part of the deal, Petra also retained an interest in the diamond once it is polished, so when the faceted gem is sold, Petra will earn 10% of the "value uplift" of that sale, as well. 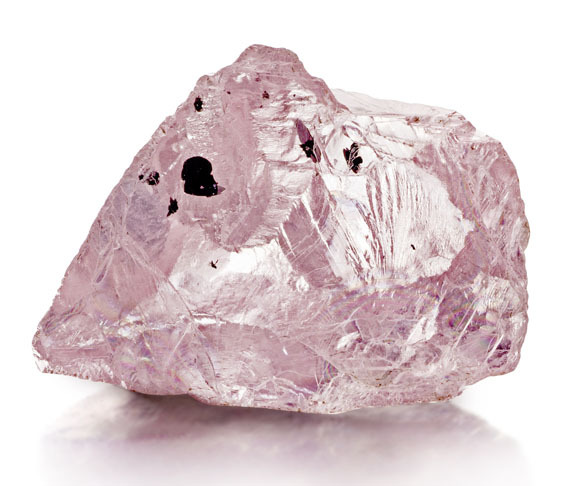 Petra's most recent find outperformed another notable pink diamond that we wrote about in November 2015. That rough diamond, also from Petra's Williamson Mine and also purchased by Golden Yellow Diamonds on behalf of M. A. Anavi Diamond Group, weighed 23.16 carats and sold for $10.1 million, or $433,938 per carat. At the time, we reported that it was Petra's most significant recovery from the mine to date. Clearly, the 32.33-carat diamond replaces the November discovery as its best find yet. Vivid pink diamonds of exceptional size and quality are a favorite of gem connoisseurs. 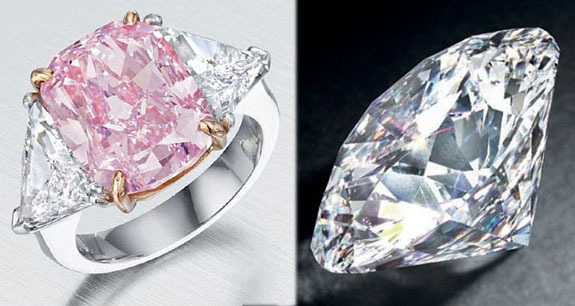 In early November, billionaire Joseph Lau purchased a cushion-shaped 16.08-carat pink diamond for $28.5 million ($1.7 million per carat), setting an auction record for any vivid pink diamond. 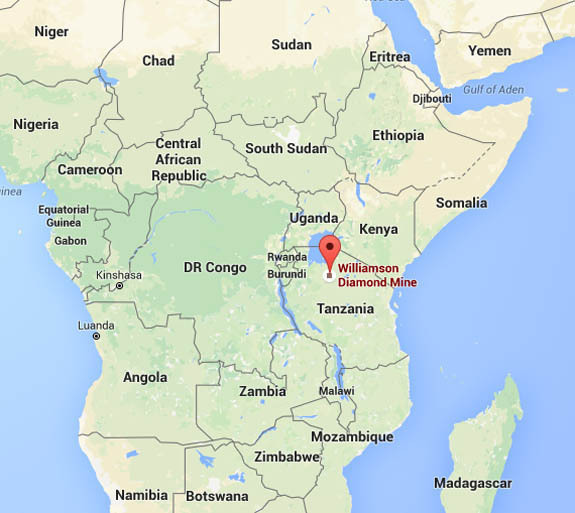 Although the Williamson Mine has been operational for more than three-quarters of a century and has already generated 20 million carats of diamonds, geologists believe the mine still has the capacity to deliver an additional 40 million carats. The mine’s average depth is only 30 to 35 meters, and theoretically it could continue to yield diamonds as deep as 350 meters. Pink diamonds owe their bubblegum color to the effects of intense pressure and heat while they were still deep within the earth. 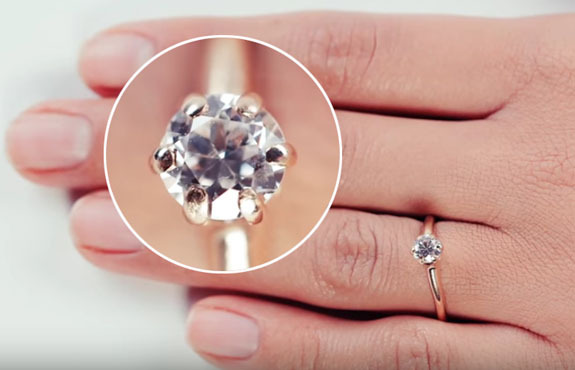 These factors caused distortions in the diamond’s crystal lattice that influence the way the diamond absorbs green light, thus reflecting a pink hue. Credits: Petra Diamonds; Google Maps. 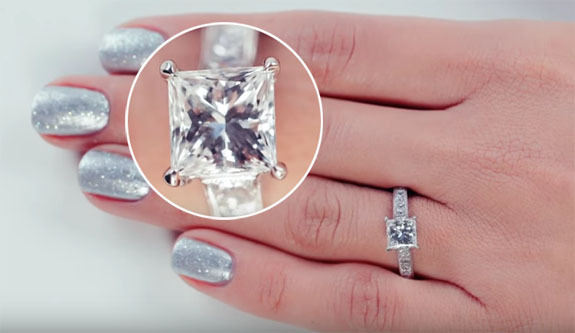 Sanitation workers in Bridgeton, Mo., defied impossible odds when they miraculously pulled a $400,000 diamond bridal set from an 8-ton pile of rotting garbage. The search took only 22 minutes. Carla and Bernie Squitieri of Clarkson Valley, Mo., had just finished their evening meal and were cleaning up around the kitchen when they got a surprise visit from their granddaughter. Earlier, Carla had taken off her rings and wrapped them in a paper towel while she was drying the dishes, but when the doorbell rang, she got distracted and temporarily lost track of her very precious keepsakes. At 7 a.m. the next morning, Bernie noticed the wadded-up paper towels on the counter, scooped them up and tossed them in the trash. Then he grabbed the trash bag and ran out to meet up the sanitation truck, which was heading down his street. "Don't forget this one," he shouted as he handed the bag to the sanitation worker. A few hours later, panic started to set in when Carla realized her rings were gone. "I'm crying, I'm feeling hopeless, I knew something had happened," Carla told TODAY. The couple put two and two together and realized the rings were probably on their way to the landfill. 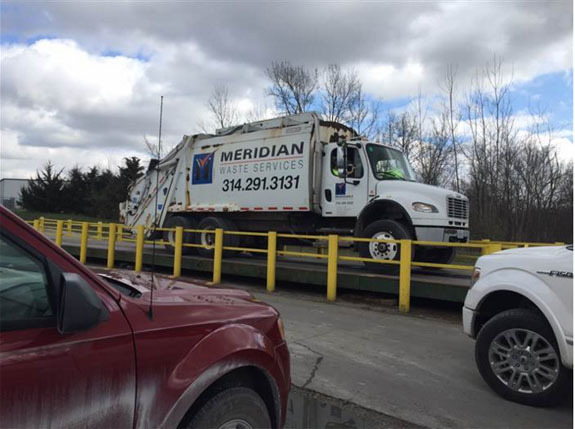 They called Meridian Waste Services in Bridgeton and learned that their trash — along with the trash of 900 other customers — was on its way to a radioactive landfill. Had the rings ended up there, they wouldn't be accessible and the chances of a recovery would be zero. However, a sympathetic operations manager, Joe Evans, agreed to divert the truck to a transfer station in O’Fallon, where the Squitieris and three sanitation company managers — all dressed in Hazmat suits — would make an attempt to find the rings. 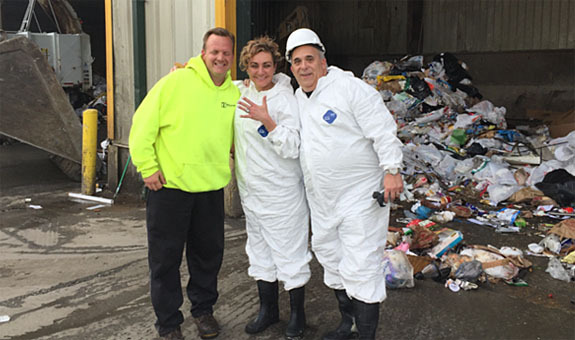 Bernie said the sanitation workers warned him that the chances of finding the rings in the 30-foot wide by 100-foot long by 20-foot high pile of garbage were "slim to none." But, in just 22 minutes, Evans had crushed the odds. "When I first noticed it, I was like, 'Oh my god I can't believe I found it,'" Evans told TODAY. "I yelled 'Hey, I found it!' Her eyes got real big, with tears of joy and relief. Ten times out of 10, we don't find something like that. It was the best feeling in the world to find that ring and give it back." "My wife was in shock," Bernie told ABC News. "It was a miracle." Without considering how gunky they were, Carla quickly returned the rings to the ring finger of her left hand. "I put [the rings] on dirty. I didn't care," she told TODAY. 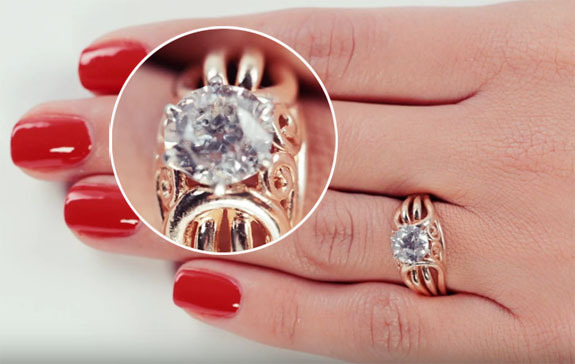 While the rings were insured, losing them would have been devastating for the couple that has been married for 26 years. Said Carla, "I planned on handing [them] down to my one and only daughter — never mind the monetary value, it's the sentimental value." Images: Bernie Squitieri; Screen captures via fox2now.com/KTVI St. Louis. 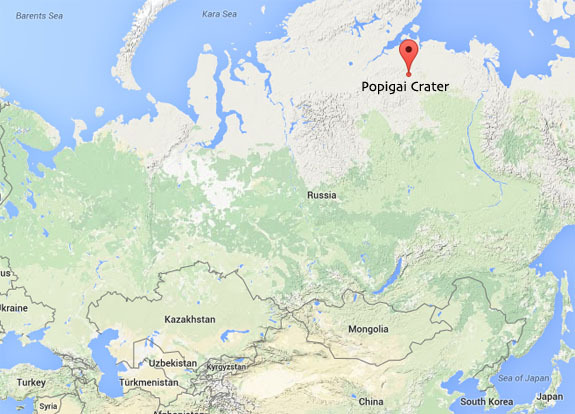 The world's largest known diamond deposit — containing trillions of carats — lies at the bottom of the Popigai Crater in a remote part of northern Siberia. 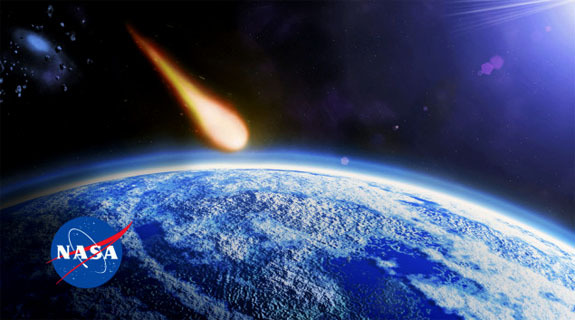 Scientists believe the crater was formed 35 million years ago when an asteroid 3 to 5 miles across slammed into the Earth with such velocity that it ripped a 63-mile-wide gash in the landscape. The impact produced an energy burst equivalent to millions of nuclear weapons and generated temperatures hotter than the surface of the sun, according to geology.com. Under this intense heat and pressure, the limestones, marbles, dolomites and other carbon-bearing rocks in the impact zone were instantly melted and transformed into diamond. Before you book your next trip to Siberia to prospect for what is estimated to be trillions of carats of diamonds, take note that just about all of them are of industrial quality. Most are tiny yellow-brown crystals, although some can be up to a half-inch in size. None are suitable for jewelry, unless your significant other has an unusual affection for blemished, off-color diamonds. Popigai diamonds are valued at about $12 per carat, according to Popular Mechanics, and are strewn over such a wide and remote area that they offer little commercial value. Today, nearly all of the diamonds used in the U.S. for industrial purposes, such as coating saw blades and drill tips, are synthetic and lab-produced in vast quantities. Interestingly, the Russian government had known about the huge trove of diamonds buried under the surface of the crater since the 1970s, but kept it a secret until a 2012. 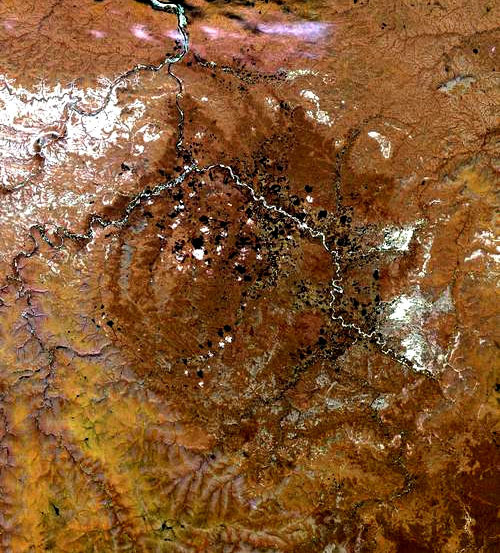 The Popigai Crater has been designated by UNESCO as a Geopark, a site of special geological heritage. Credits: Asteroid illustration via NASA; Popigai Crater image via NASA, public domain; Google Maps.